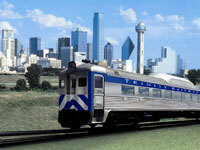 A variety of transit options are available in the North Texas area. The three main providers are Dallas Area Rapid Transit (DART), which serves the Greater Dallas area; Fort Worth Transportation Authority (FWTA), which serves the Fort Worth area; and the Denton County Transportation Authority (DCTA), serving the Greater Lewisville and Denton area. These authorities offer numerous bus routes. DART also operates a light rail line. The Trinity Railway Express, which provides commuter rail service between Dallas and Fort Worth, is jointly implemented by DART and FWTA. During the ozone season (which runs from March 1 through November 30) DART, FWTA, and DCTA participate in the Ozone Season Transit Education Initiative, which is an enhanced effort to generate increased participation in trip reduction programs and encourage behavioral changes during ozone season.